I've had alot of fun during our last two rides. The first ride it was my mom and I, with Artemis running free in the arena. She was in a very energetic mood. She kept running circles around us, bucking and tossing her head around. She'd run in front of Jimmy, cut him off and then slam her breaks off. Then when he tried to go around her she'd lay her ears flat against her head and chase him. It was pretty funny to watch. She's definitly taken after her mom with her bossiness. 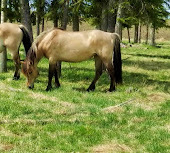 When I had gone out to catch her that day the pasture horses were just coming up for a drink of water. They were all at the water except Artemis and she came running up, bucking, and then chased off all the other horses away from the water except for one. She even chased the lead mare away. Tona was the only one she let drink. If the others tried to come over to drink, Artemis would lay her ears back and they'd back off. Socks and I just played around with Artemis. We'd lope a 20-metre circle and she'd lope it beside us. Then she'd go bucking away from us and run over to my mom and Jimmy. We didn't do any real work, we were just fooling around. Today when we arrived the arena was full of people. D was going to have a lesson so we tried to saddle up slowly. Luckily when we finally got on only D and M were still in the arena. We rode around with M and Zanza. Socks, who's been in heat lately and kind of cranky, decided she can't stand Zanza and would lay her ears back and try to snap at him if he came near. Once D's lesson was over I pulled out the barrels and set them up. I haven't worked on them lately because I knew Socks' teeth were going to get done and I wanted to wait until after to start training again. Her turns are so much better now. Usually when I train though, it's just Socks and I working on the pattern while my mom does whatever with Jimmy. M wanted to try them too with Zanza so tonight her and I took turns. It was a lot of fun. It was fun to watch M and Zanza, this giant Thoroughbred all decked out in his shiny english gear doing the barrels. He was great for his first time around them. M had a lot of fun doing them too and it's the best Socks has been forever. She's such a competitive horse and if she doesn't have any competition, then she gets lazy and puts no effort in. The first few times Zanza went around she didn't pay attention. But the first time he cantered around them my horse was glued to him. She just stood perfectly still, ears perked forward and eyes trained on him. She got serious about it after that. It was a lot of fun, we're going to try to get together again to do it. Socks needs the competition and it's good to expose Zanza to different things, including our brightly coloured barrels. Socks and I managed to knock over two barrels, both times when I was too busy looking at the barrel to steer her. It was a lot of fun, I forgot how nice it is to ride with other people. I'm glad you've been having some better rides lately! Artemis sounds hiliarious. Like mother, like daughter I suppose. Glad to hear your ride went so well. It's been AGES since I rode with someone, I miss it.